SOHO: Save our Historical Organization was formed in January of 1969. 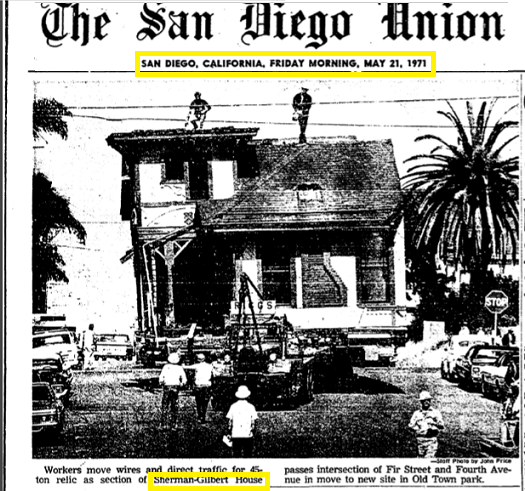 The primary objective was to save historic Victorian style houses from being demolished and eradicated from the San Diego landscape. The fate of the Gilbert House provided a rallying point for the newly formed organization. SOHO: Save our Historical Organization would go on to save many historic buildings and leave a time capsule for future generations. Heritage Park, is comprised of the Senlis Cottage (1896), Sherman-Gilbert House (1887), Bushyhead House (1887), Christian House (1889), McConaughy House (1887), Burton House (1893), and the Temple Beth Israel Synagogue (1889). All of the buildings are from the Victorian era and are representative of different styles of architecture. History and apparitional experiences sometimes collide, which is a case being made by local paranormalists. San Diego Paranormal Eye (SDPE) is a San Diego based paranormal group currently hosting outdoor meetups at Old Town and Victorian Village several times a year. While SDPE believes in the possibility of apparitional experiences throughout Heritage Park, the Christian house seems to yield better results. The most predominant ghost may be that of a female spirit about 20 years old. All investigations are being held outside as access to the interiors of the buildings is not currently permitted for ghost hunters and paranormalists. The primary activity noted for the Christian house is located near the exterior front door area. The paranormal activity has been witnessed during ITC communication using spirit boxes, dowsing rod sessions, and the Xcam SLS (Structured Light Sensor). The Christian House is not the only purportedly haunted Victorian in Heritage Park. The McConaughy House (1887), which is currently host to the Coral Tree Tea House and Old Town Gift Emporium, is perhaps more well known in the paranormal community. The current business owners’ website states proudly, ” There is no doubt that this beautifully restored house is spirited.” More information can be read on their website http://www.coraltreeteahouse.com/CoralTreeTeaHouse/Ghosts.html . Sherman Doig House 136 W Fir St. The Shermin-Gilbert house exterior has yielded some minor activity. A shadow figure has been allegedly seen moving towards the backside of the building, but to date has not been captured on media. Some sessions using dowsing rods have been performed outside the location in an attempt to communicate with this possible apparition.